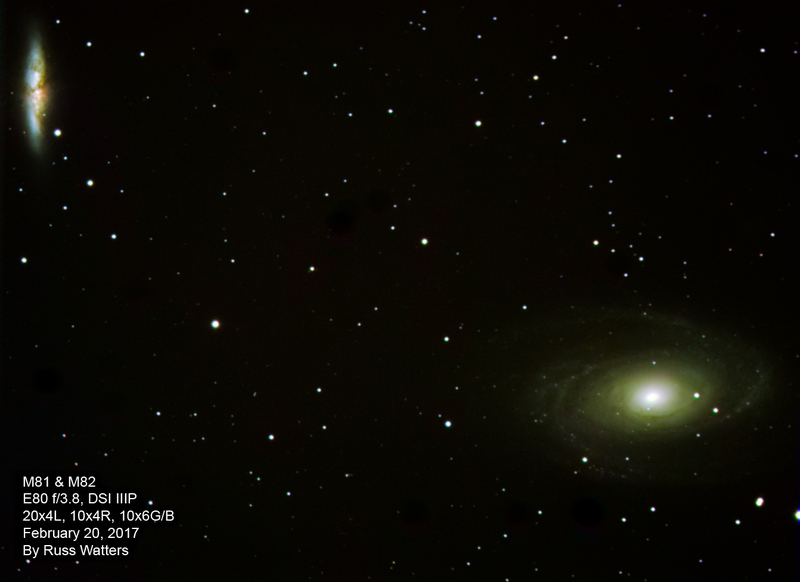 M81 and M82 in one frame. 4 hours of exposure. February 20, 2017. 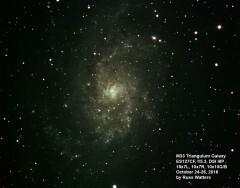 An update on M33: 7 hours exposure over 2 nights. October 24-26, 2016. 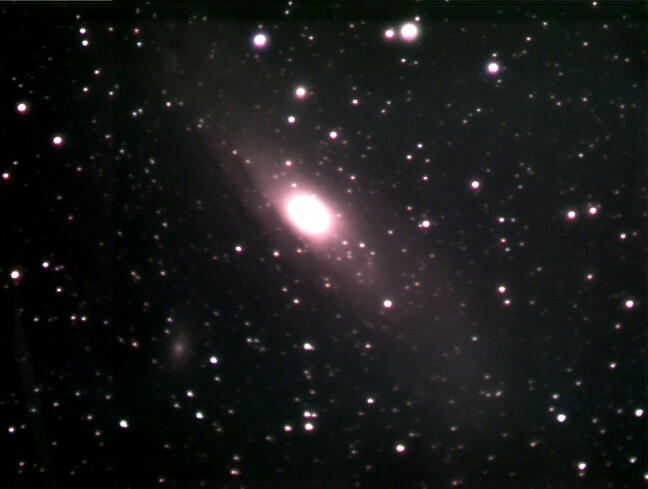 One of our closest neihboring galaxies, M31 The Andromeda Galaxy. 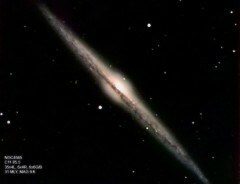 At 2.5 million light years away and 140,000 light years in diameter, it covers 6x the width of the moon in the sky. 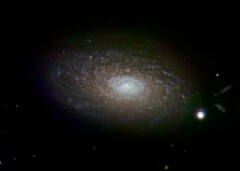 The core is visible to the naked eye as a small fuzzy patch. 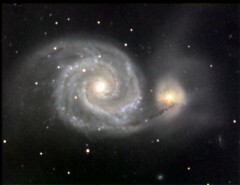 This is a two-pane mosaic, 72 minutes of exposure. 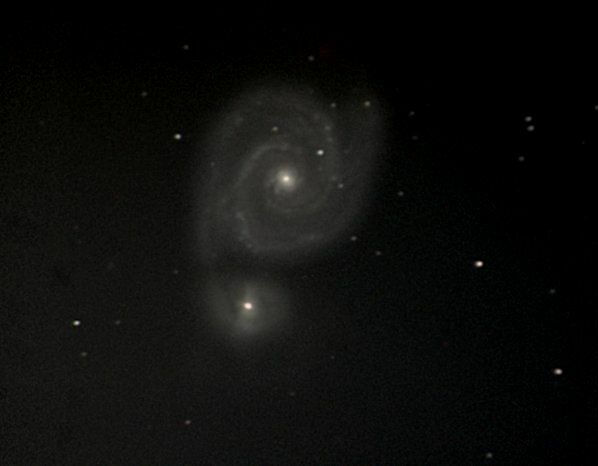 M-51, 5/21/09. Three hours exposure. Compare to the earlier attempts below This galaxy has no name, just the catalog number NGC4565. 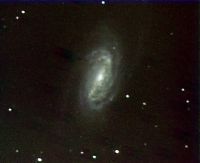 It's a spiral galaxy, viewed edg-on. It is 31 million light years away. 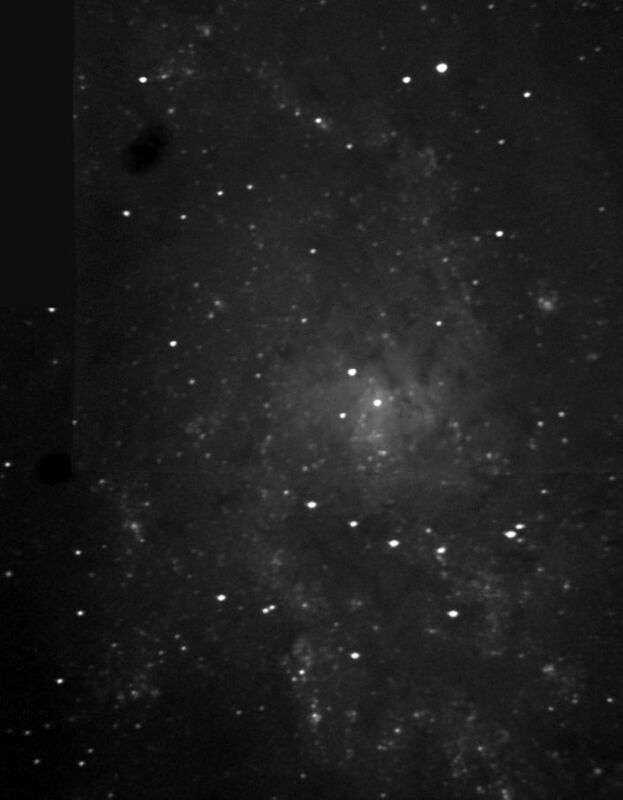 This is just under 4 hours of exposure, 5/19/09. 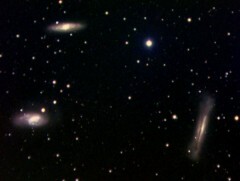 This is a galaxy cluster called the Leo Triplet. The galaxies are about 35 million light years away. Total exposure, about 6 hours over two nights at the end of March, 2008. 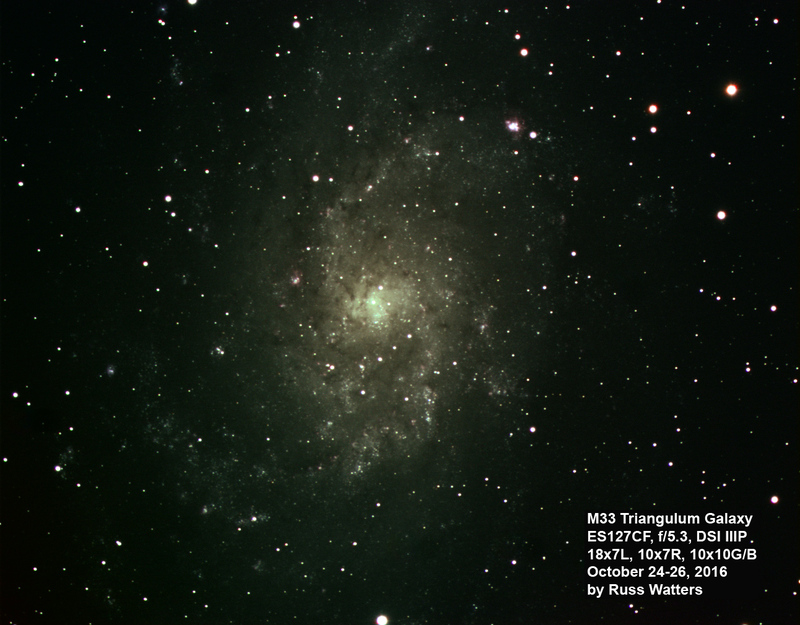 M33, The Pinwheel Galaxy. 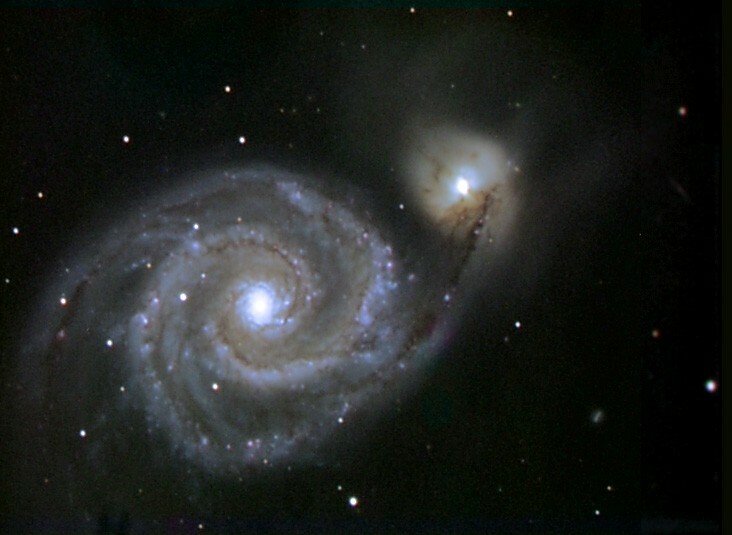 3 million light years distant (one of our closest neighbors) and 60,000 light years across (relatively large). It covers more area in the sky than the moon and is visible in binoculars. This is about 4 hours exposure, LRGB, on 10/20/07. 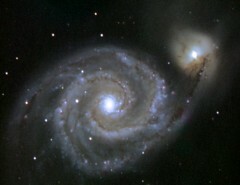 M101, the Whirlpool Galaxy. 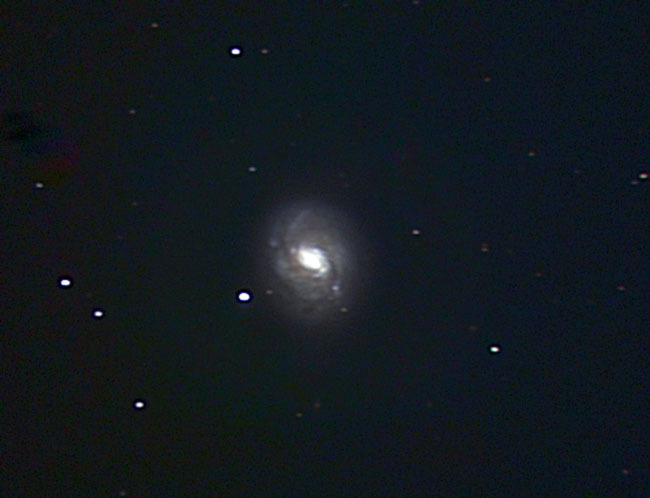 I'm a little disappointed in how noisy it is, considering how much time I spent on it - it is 7 hours of exposure over several nights in May, 07. The galaxy is almost as big as the moon in the sky even at 27 million light years distance. 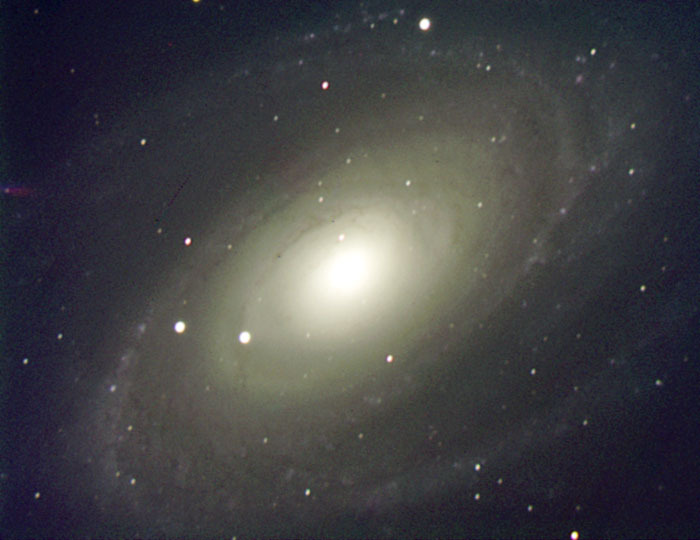 It's a huge galaxy, at 170,000 light years across. M-51, again. 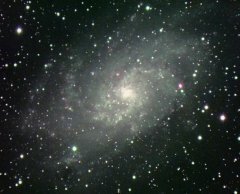 this is my favorite galaxy, so I've taken a few pictures of it. 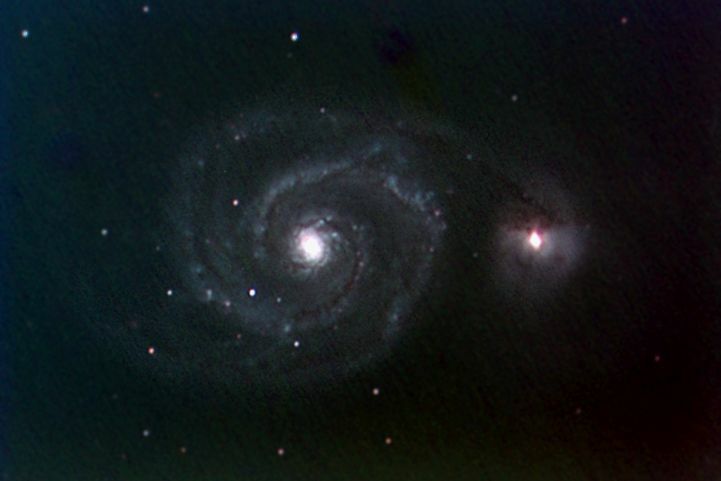 This is about 4 hours of total exposure, taken on 3/5 and 3/9/08. It's much better than the one I took last year. This is luminance data taken on 3/9/07 combined with color data from 2/7. I may yest redo the luminance data, but obviously the color data needs to be better. Still, it is a huge improvement. 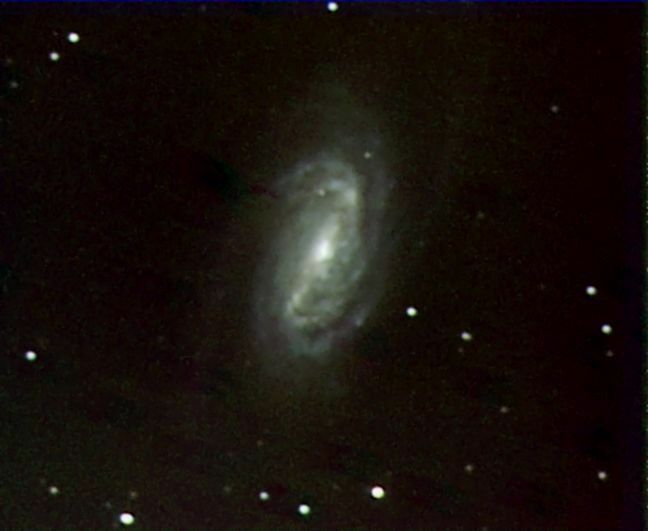 60x2min luminance. 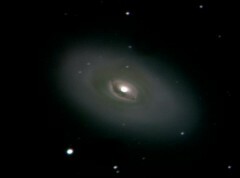 This is M-64, AKA the Black Eye Galaxy due to the appearance of a partial ring of dust that obscures some of the stars near the core. The colors aren't' right, but it looks cool. 5 1/2 hours worth of exposure time, LRGB, taken 4/20/07. 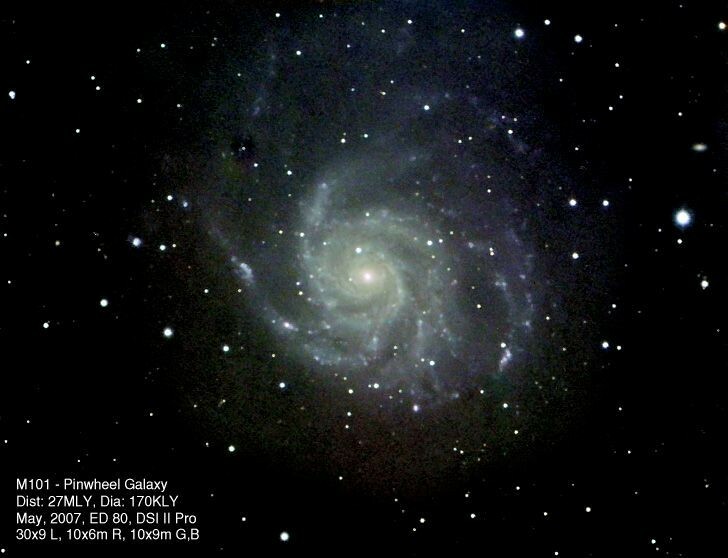 The Sunflower Galaxy again, taken 3/18/07. It is nearly five hours of total exposure. Compare it to the previous one below - huge improvement. I spent about 9 hours in a parking lot the day after Thanksgiving, and I got quite a few good pictures. 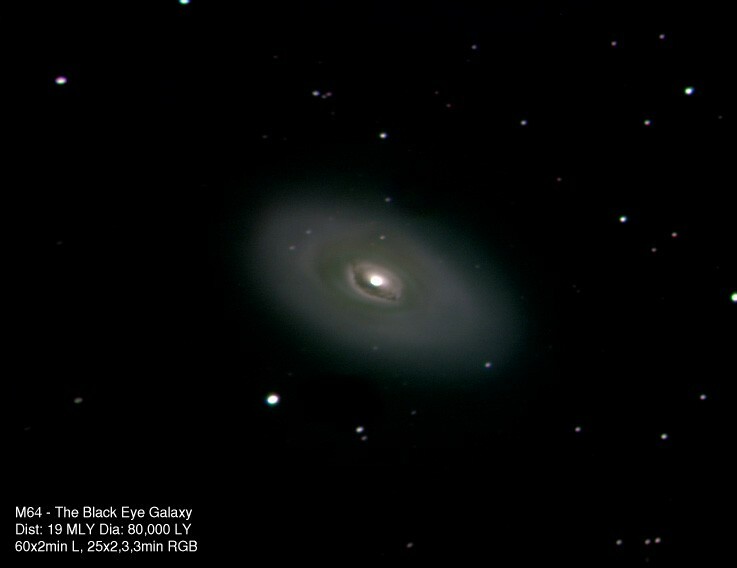 This is M81, again. It is a luminance only image, 25x45s. 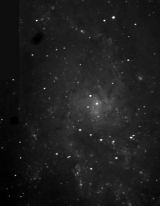 I learned that night that when the temperature drops 20 degrees in 2 hours, my telescope shrinks enough to go out of focus! I took color photos that didn't come out. 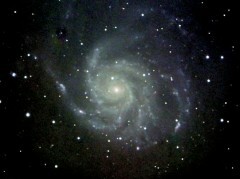 This is M77, a spiral galaxy about 60 million light years away, also taken 11/24/06. 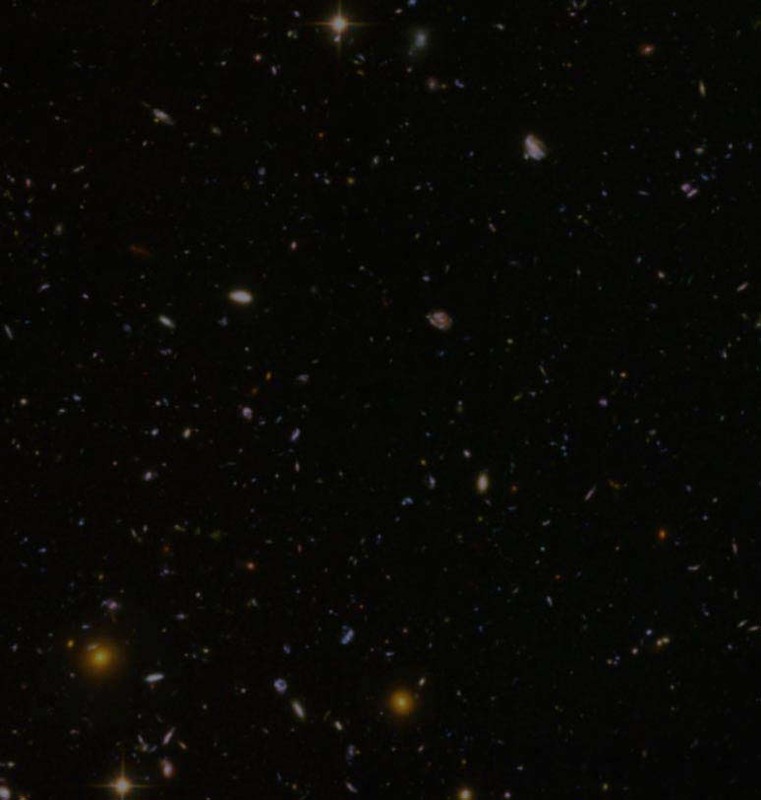 It is relatively large, at 120,000 light years (ly) across (a little larger than our galaxy, the Milky Way). 15x45s, lrgb. 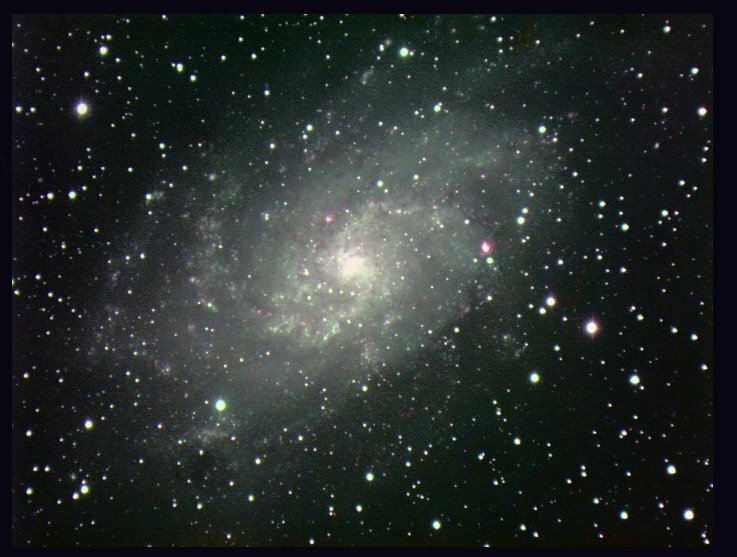 This is M33, aka the Pinwheel Galaxy. 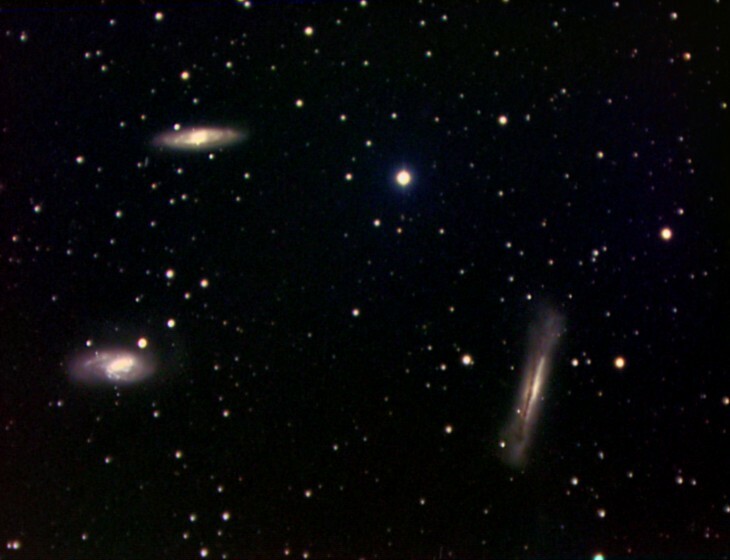 It is big and diffuse, so this is a composite of two images (I really need a composite of 4 or 6). 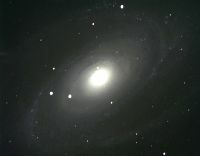 It is about 3 million light years away and 50,000 in diameter (3rd largest in our local group, behind M31 and our Milky Way. 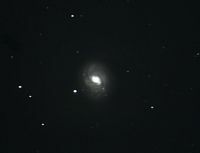 20x45s, l.
This is M82, a neighbor of M81. They are only about 150,000 ly apart. Sometime, I'll take a wider angle image, showing both in the same field of view. 20x45s, rgb. 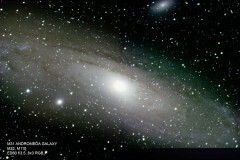 This is another picture of the Andromeda Galaxy, our large, near neighbor, 3 million ly away and 250,000 across. 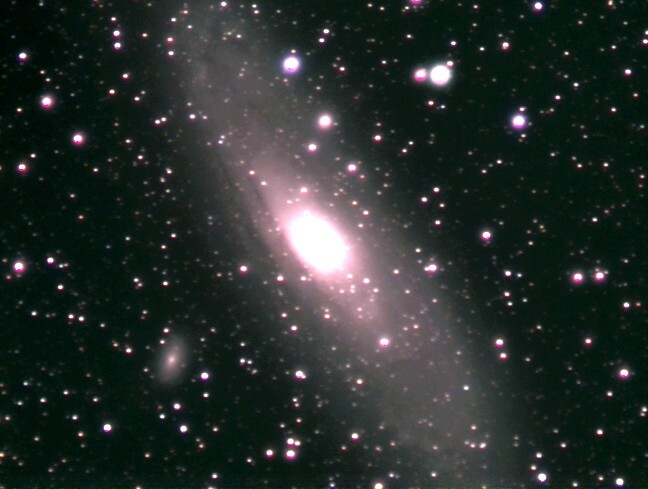 20x120s, c.
This is the galaxy M31, the Andromeda Galaxy. 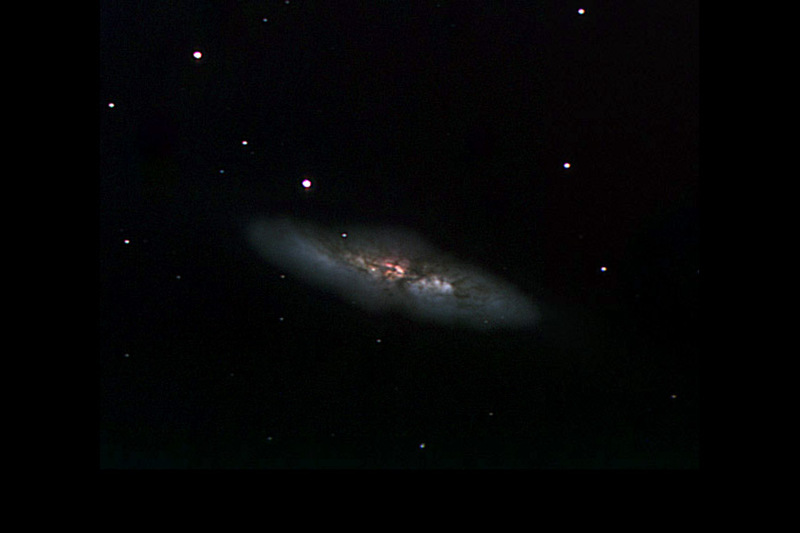 It is one of our closest neighboring galaxies, and fairly similar to ours. In the sky, it's about 8x the width of the full moon, but dim enough you need binoculars to see it. This image was taken on 9/20/05 with a 135mm SLR camera lens piggybacked on my ETX-105 for guidance. It's a stack of about 20, 30 second images. 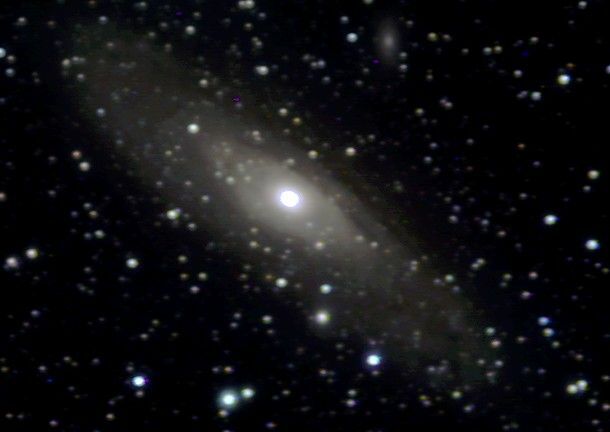 Andromeda Galaxy again, 20, 30 second images, darker skies on 9/27/05. 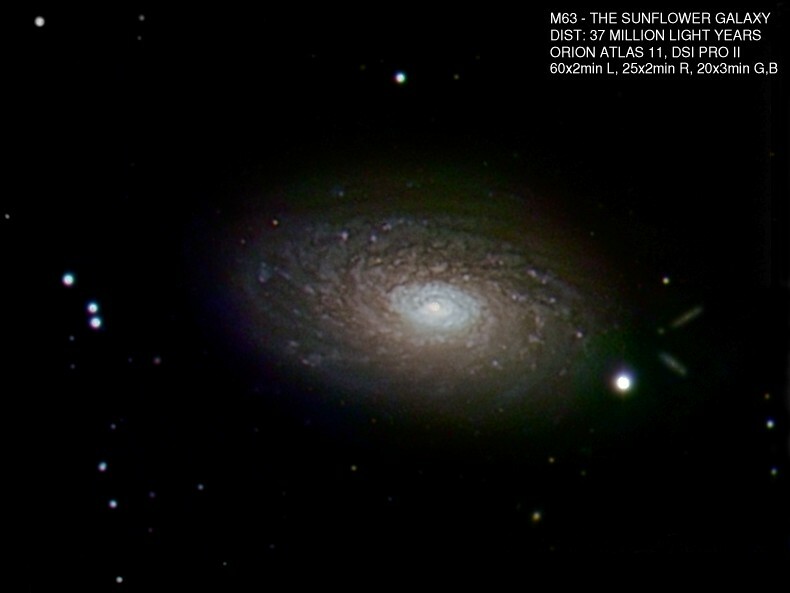 Note the smaller satellite galaxy, M110, to the lower left. 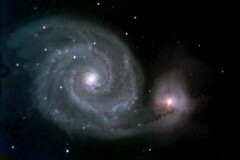 This is the spiral galaxy M51, tearing apart the smaller galaxy below it. They are about 37 million light years from earth. This image is a stack of 30 second exposures. 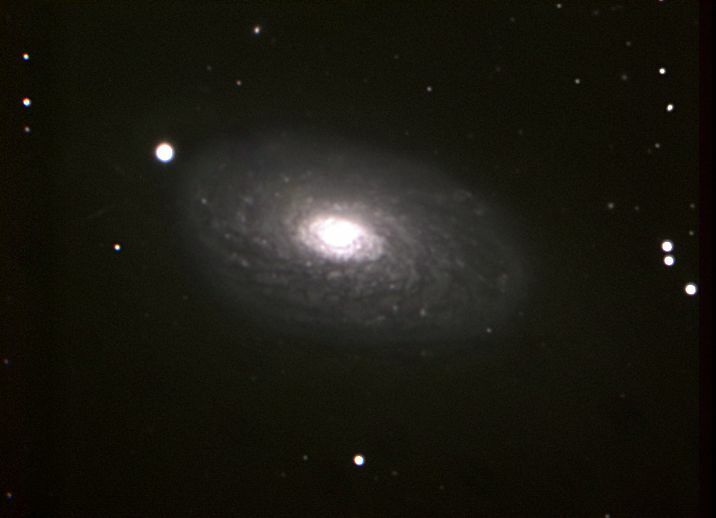 This is the only decent image of a galaxy I took it with my ETX-105.